My first love is birding. I have alsways seen my little patch as devoted to the local birds and try to make it useful to them and attractive to birds too. I live in an odd part of Britian with a maritime climate that is missing some species that are common almost everywhere else… like Treecreepers. Like most birders I keep a garden list… those that actually visit the garden, and those I have seen from or right above the garden. These latter have included some interesting birds like European Stork, Osprey and Fulmar. Birds that have actually visited the garden is a pretty short list… with birds commonly seen elsewhere missing, and birds that people travel to see more regular. In the fourteen years we have lived here I have seen just one Goldcrest in the garden… but have had a number of Firecrests including, on one amazing day no less than five individuals! Last winter was the first time I have ever seen a Fieldfare here, one came and stayed for five days solid. 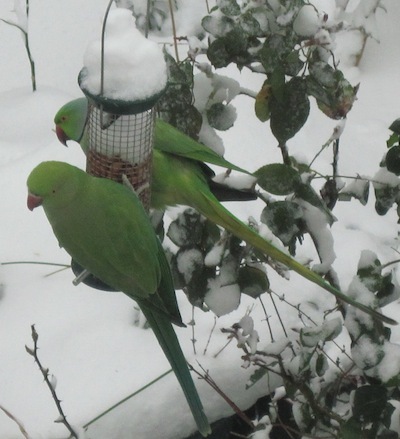 It sat on an apple (we string them up for the daily Ring-necked Parakeets) and ate it completely sitting there for hours as other birds came and went and even nodding off whilst clinging to the fruit. Next day it came back and again stayed all day eating an apple… when it left we never saw it again. This is typical of my tiny patch. Some of the birds get pretty tame, especially the doves, Blackbirds and Robins and, latterly, the Ring-necked Parakeets… but there are limits imposed by the neighbourhood cats that come in despite every attempt to deter them. Most do not allow me close enought to snap them when I have a camera. This courting couple had forgotten to tick the ‘no publicity’ box.